Applied Handling NW provides pallet racking products and warehouse solutions that provide a wide range of solutions for warehouse storage needs. Industries which rely on moving or storing large quantities of items benefit from using a pallet racking system. Pallet racks are structures which allow for the storage of pallets both in rows and vertically. These structures are customizable and easily combine with other product handling systems to enhance product flow within a facility. A proper designed pallet racking system can greatly increase a warehouse’s storage per square foot, productivity, and profit. Each industry, company, and warehouse is different and they all require unique solutions to meet product needs. To find the best fit for your warehouse, it is best to understand a few key areas which all interact with each other, ie., selection versus depth, storage length, inventory control methods, and integration needs. Before deciding on the proper pallet racks, be sure to take into consideration all of these areas. The first area to consider is selection versus depth. For example, a wide selection of products is best suited to be stored on selective racks, while a fewer titles with deeper inventories may be better suited for drive-in or drive thru racks. Also, be aware of the acceptable length of storage a product has, some products like food have expiration dates and may not make sense to keep a deep inventory. Inventory control methods include last-in, first out and first-in, first-out methods. A push back pallet racking system only works within a last-in, first out method while flow racking works only in first-in, first-out methods. Finally, be sure to think about any integration needed within the warehouse. Pallet racking systems can easily be brought into other systems to create optimal product receiving, handling, and shipping. Look at the pick modules system section for the best use of these systems. 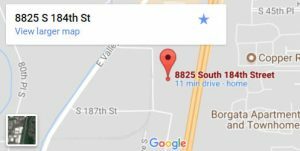 Applied Handling NW has a location in Kent, Washington for all of your pallet racking needs within the region. After taking into consideration all of the above areas, you can be better informed about the proper pallet racking systems for your company. Below you will find more information about the types of industries which can benefit from pallet racking and the many different styles of pallet racks. You can use this information to better inform yourself about how to implement your pallet racking system. 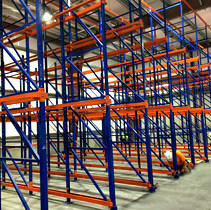 Commonly used across many industries, selective pallet racking systems can be found in a wide variety of industries. These systems allow for access to each pallet bay but also require forklift access in aisle ways to stock each bay. A selective system is best used within a facility which has a large variety of product but a low turnover of individual products. There are two varieties of construction material, one for heavy-duty use and one for flexible use. Learn more about selective racking. Push back pallet racking systems are great options for warehouses that work with some selectivity of product but with multiple pallets of each product. This racking system works by using gravity to feed the front of the system with angled rails. 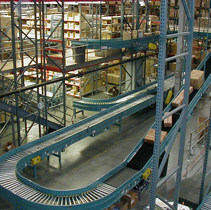 Each product lane is independent from other lanes and these lanes can hold 2 to 6 pallets per lane and allow for a last-in, first-out product management system. Learn more about push back pallet racking. 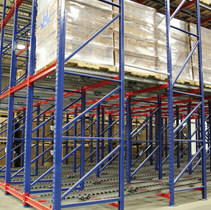 Pallet flow pallet racking uses gravity to move pallets from a loading side to an unloading side. Due to the way the system moves product, this style is also called gravity flow racks. As a pallet is removed from the unloading side the pallets behind will automatically fill in the front position. This allows for more storage of a single product. The pallet flow system is best implemented in a first-in, first-out system. Learn more about pallet flow pallet racking. Both drive-in and drive thru pallet racking systems are similar. 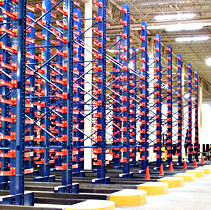 They allow forklifts to load and unload products from one or both sides of the rack through a system of support rails. Each pallet position is dependent on the position of the other pallets. Drive-in systems have a single entrance while drive thru systems allow for access on either lane. These systems are best used in high-capacity storage for a product. Learn more about drive-in and drive thru racks. Carton flow / case picking pallet racking is a great system to increase product flow. These systems use gravity to feed the front of the rack with product loaded from the back side. Carton flow systems are versatile, implementing either a roller lane which acts as a single flow or on wheel beds which allow for a variety of products to be used. This system works best with case- and piece-picking needs. Learn more about carton flow / case picking racking. Cantilever pallet racking systems allow for the storage of large and awkwardly shaped items. Different from traditional pallet racks, these systems are made from a series of columns with adjustable arms. 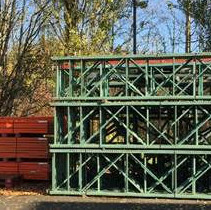 The construction of these racks means that there is no limit to the length of the stored product. This also means there is the capacity to store a wide variety of lengths, shapes, and weights in the same rack system. Learn more about cantilever racks. Rack supported structures play double duty. 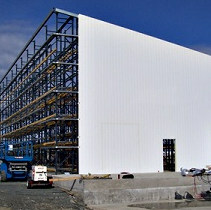 In addition to their use as a storage system, rack supported structures support the building as well. Once the rack structure is built, it will then be covered with walls and/or ceilings to protect the products. By combining the building phases of the building and the racking systems, these structures save time and money. These systems are a great way to create an ideal storage area. Learn more about rack supported structures. Pick module pallet racking systems combine different features of storage, product handling, and shipping systems to make the most efficient system of high-volume case picking and small parts distribution. These systems use a variety of options including pallet racking systems, case flow racks, and conveyor systems. A pick modules system utilizes every option available to create a custom designed system. This provides the best solution for each project. Learn more about pick module systems. 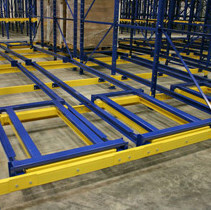 Whether buying or selling, Applied Handling NW handles your used pallet racking system needs. After carefully examining all used pallet racking systems, we ensure the safety of each unit before resale. 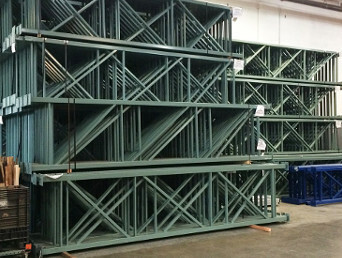 As our inventory of used pallet racks change we may be able to offer an exact match for your current needs. Based on our inventory we may only be able to offer the best solution for you based on what we have in stock. Learn more about used pallet racks. 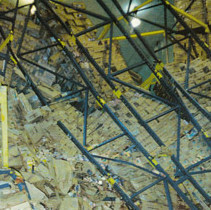 Pallet racking systems are most efficient when used with proper safety and accessories. Safety of pallet racking systems can be enhanced through different safety accessories both on the racks and separate from the racks. Repeated use of pallet racks requires maintenance and inspection to prevent any problems. If any safety concerns are found, it is important to repair the parts causing concern. Learn more about pallet rack repair, safety, & accessories. 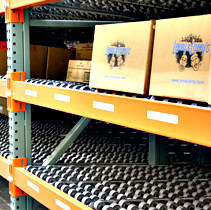 Pallet racking systems provide solutions to all of your facilities product storage needs. Pallet racks come in a variety of styles to meet the many needs of individual warehouses. Depending on needs such as selectivity, storage capacity, and product handling methods, pallet racks can greatly increase productivity as products are easily available when needed. Pallet racks are easily able to be combined to work with other styles or integrated within other systems within your facility. Applied Handling NW can help maximize your product storage and handling capacity by saving your time, energy, and money. 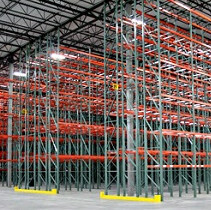 We offer a wide variety of pallet racking systems, both new and used, to fulfill your racking needs. Are you looking for traditional pallet racks such as the selective racks, a full structure supported racking system, a high-volume drive thru rack, or any other pallet racking service? We can work with you to match our product with your requirements. For all of your pallet racking needs in and around Kent, WA, please contact us today to speak to a member of the Applied team.